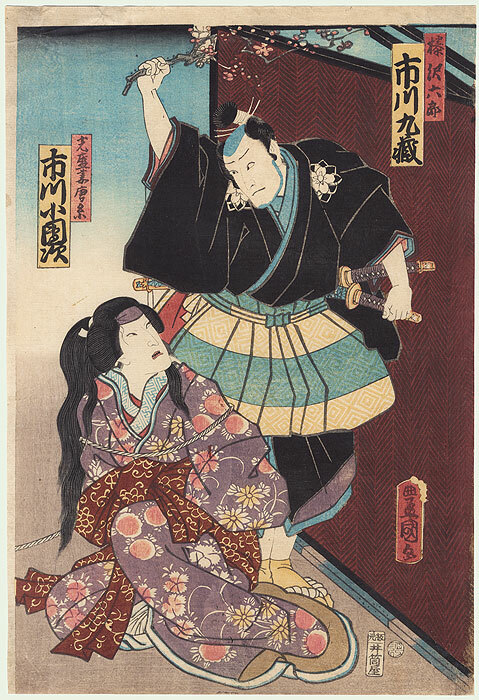 Unusual kabuki scene of a samurai preparing to beat a bound courtesan with a flowering cherry branch. He raises the stick above his head, looking down at the captive with a worried frown. The beauty stares up at him disdainfully, a rope tied around her torso. She wears a purple kimono patterned with pink and yellow blossoms, tied with a brown and yellow print obi. Her long hair is pulled back into a ponytail with shorter locks falling over her shoulders. 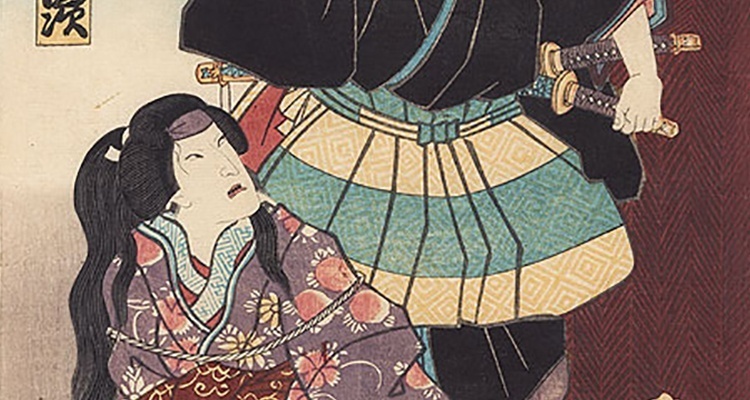 Nicely detailed with fine line work in the hair and the woven garden fence at right, and a subtle burnished pattern in the black kimono.Unusual kabuki scene of a samurai preparing to beat a bound courtesan with a flowering cherry branch. He raises the stick above his head, looking down at the captive with a worried frown. The beauty stares up at him disdainfully, a rope tied around her torso. She wears a purple kimono patterned with pink and yellow blossoms, tied with a brown and yellow print obi. Her long hair is pulled back into a ponytail with shorter locks falling over her shoulders. Nicely detailed with fine line work in the hair and the woven garden fence at right, and a subtle burnished pattern in the black kimono.